The Crown’s Settlement Offer was negotiated on behalf of Ngāi Tahu by the Ngāi Tahu Negotiating Group. These people followed in the footsteps of many Ngāi Tahu who have, over the years, worked tirelessly to have Te Kerēme resolved. The team was further refined into three task groups for the negotiation of the draft Deed of Settlement that forms the Crown’s Settlement Offer. The Crown structured its own negotiating teams to match the Ngāi Tahu model and contracted a partner from Coopers and Lybrand to fill the role of negotiating team leader. This team was mandated by Te Rūnanga o Ngāi Tahu to manage the negotiations process and to carry out the tasks necessary to advance the resolution of Te Kerēme. It was responsible for negotiating directly with government Ministers and resolving the major negotiating differences, and was chaired by Sir Tipene O’Regan. Other Ngāi Tahu leaders in the A-Team at the time of the Crown’s formal Settlement Offer were Trevor Howse, Kuao Langsbury, Edward Ellison and Charles Crofts in his role as Kaiwhakahaere of Te Rūnanga o Ngāi Tahu. Rakiihia Tau (Snr) was a member of the A-Team until shortly before the Crown’s Settlement Offer was received. He was replaced soon afterwards by his son, Rakiihia Tau (Jnr). The Principals were also supported by Paul Baines, formerly of CS First Boston. This executive team worked directly with, and advised, the Ngāi Tahu A-Team on all matters relating to the Claim. During the negotiations it dealt with high-level officials from many government departments, including the Office of Treaty Settlements, The Treasury, Crown Law Office, the Department of Conservation, and the Crown’s legal advisers, Chapman Tripp. Along with the C-Teams, the Ngāi Tahu B-Team bore the brunt of the day-to-day negotiations with the Crown on every aspect of the Crown’s formal Settlement Offer. The B-Team was led by the Chief Executive of Ngāi Tahu Group Management, Sid Ashton. The team also included legal adviser Nick Davidson from Bell Gully, commercial adviser Richard Meade from First NZ Capital, Charles Crofts, and Claims Manager Anake Goodall. These diverse teams carried out the detailed research and clause by clause negotiation of the various sections of the draft Deed of Settlement that made up the Crown’s Settlement Offer. These teams also interacted with the officials and staff of various government departments, often at an operational level. Actively supporting the B-Team, and advised by kaumātua and many other tribal experts, these teams were divided into separate task groups. Each group focused on a separate aspect of the Claim, such as mahinga kai. C-Team members participated in the regular negotiating sessions between Ngāi Tahu and the Crown B-Teams. The team leaders for the various Cultural Redress teams included Diane Crengle, Justine Inns, Jan West and Sandra Cook. They were assisted by legal adviser Linda Constable of Lane Neave. 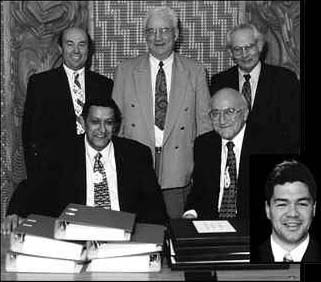 Te Maire Tau led the Apology team and Tony Sewell was team leader for the Economic Redress group which also included David Chisnall of Bell Gully. A number of other professional advisers were also used on a case by case basis to support the teams in their work. At least one B-Team member and/or A-Team member participated in the work of the individual C-Teams. Regular meetings were held between each of the various teams and their members to ensure that the negotiating effort was at all times focused and coordinated. This strategy contributed significantly to the successful resolution of the negotiations. Many advisors from individual rūnanga were also consulted, along with the part-time involvement of others for specific advice. This combination of tribal and professional expertise, allowed the successful progressing of the Claim to the point of receiving the Crown’s Settlement Offer.